a reference book for foundry suppliers to know more about purchasers and their purchasing demand. On the basis of Global Foundry Purchasers Database and the FSC online platform, this book covers detailed information of the purchasers, such as their related industry, their purchasing need, prefered casting material and technique, required machining abiliity, the contact information of the purchasers, etc. All purchasers information has been verified. To meet the requirement of the purchasers, we look for more purchaser' information. And the information is totally updated half a year. FSC full members and the FSC attendees will be able to get the purchasers' information of this book on our website. 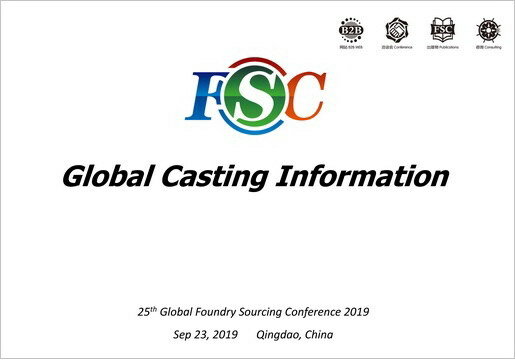 Regularity: "Global Casting Information" is published regularly half a year, following the Global Foundry Sourcing Conference.